The Growth Schism: Could a Sound Bite Save the World? But you also know that growth, because it ostensibly leads to much needed jobs, is a political given. That’s why you’ll never hear a candidate come out against growth. If that candidate has studied growth as taught in conventional economic circles, she’s been told that growth is the solution to virtually all economic problems and that, because of the way the “free market” works, resources are in practice not finite, that pricing factors will always lead to substitutes and alternatives. On the other hand, if she has studied environmental economics, she’ll be aware that not only does the market not have the ability to break the laws of physics, but perhaps more relevantly, growth does not solve all economic problems and, in fact, does not even improve lives. We’ve known this for a while. Yes, growth is indeed necessary and a positive force – up to a point. When the members of a society don’t have adequate shelter and sustenance, growth is critical to achieving those essential needs. 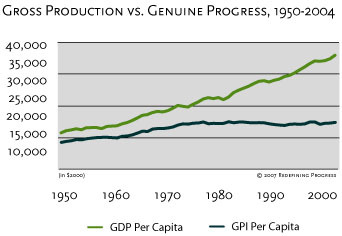 But there’s a diminishing returns curve here and, after a point, growth no longer makes us happier. I thought this observation was so important that I found a way to include it in my book on sustainable design despite it not being – directly at least – about design. You wouldn’t know it from political discussions (see dilemma above), but there has been a slew of research and books on this topic of late. I mentioned a few of them in an earlier post. Most of them are discussing growth in the context of developed countries, where fundamental human needs, for the most part, have been met. Assuming one accepts the premise that growth is necessary until that point has been reached, a question that follows is: what is that point? We may have a partial answer in the form of research by a team of economists from UCLA and USC. 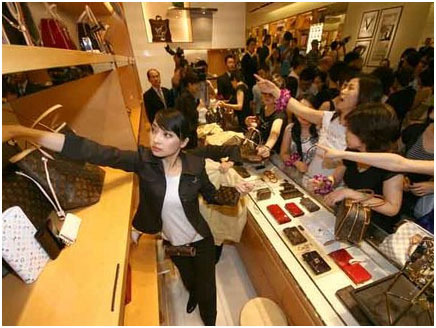 Summarized in a recent New York Times op-ed by Richard Easterlin, a member of that team, they found that a quadrupling of per capita consumption in China over the past 20 years was accompanied by a decrease in life satisfaction. However, a mountain of evidence shows that, at least in developed regions and countries like the U.S. and Europe, growth is not the panacea that most politicians believe it is. Or perhaps they do realize this, but know that it is just too complicated an idea to explain in sound bites. Coming out against economic growth would leave any candidate vulnerable to easy pickins. Which brings us back to the superficial tactic of finding a way to pose the idea in a positive light. If “no growth” or “antigrowth” are non-starters for a political platform, well we need to find a way to recast the idea in a way that illustrates the reasons we should, in fact, desire the end of growth. As with several previous EcoOptimism posts, we’re drawn back to the issue of communication. In this case, the problem is how to communicate that growth – such a positive sounding goal – is not actually good. Or smart. Or even possible, at least not in any version of our finite planet. “Post-growth” has been suggested by a number of people and it has potential. I fear, though, that it begins to evoke post-apocalyptic associations. I’ve pondered “regrowth,” but I think it still requires too much explaining. It may be that we need a term that sidesteps the problem by not evoking growth at all. Juliet Schor’s Plenitude is one attempt; however it doesn’t make the cut in terms of being popularly self-explanatory either. So we do indeed have a dilemma. It’s a critical one for EcoOptimism: how to make a counterintuitive idea appealing? Facts and figures we have aplenty. It’s the sound bite we’re missing. This entry was posted in Economics, Messaging, Politics and tagged free market, GDP, growth-economic, happiness on October 16, 2012 by David Bergman.